Most of the time you have come across situation where in you have to give bribe to get your work done. Corruption is pervasive and also corrosive. 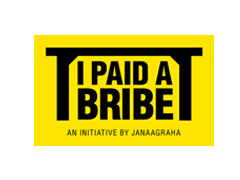 To fight against corruption Banglore based NGO has launched website ipaidabribe.com that focuses on petty retail corruption in India. It helps the average Indian post his or her bribery experience and it also uncovers the “market price” of corruption in various cities, departments and services. This website allows Indians to post their bribe experiences under four distinct categories — I Paid a Bribe (captures incidences of bribery), I Am a Bribe Fighter (experiences where people resisted bribery), I Met an Honest Officer (recognizing honest officers) and I Do Not Want to Pay a Bribe (educating Indians how to avoid paying a bribe). According to the website, Delhiites, for example, have paid Rs 500-1,000 for police verification for passports. Mumbaikars have paid a petty Rs 20 to as high as Rs 21 lakh as bribes to the police. “Paying a bribe is a very lonely experience. We want to change that,” says Swati Ramanathan, co-founder of Janaagraha, a Bangalore-based NGO that is also steering the ipaidabribe.com initiative. While the website does not allow the mention of names, the naming and shaming of government departments has had some success. For example, the transport commissioner in Bangalore used the website’s feedback to reform its procedures and minimise bribery cases with a thrust on automation. For example, licences can now be applied online. In a global first, Bangalore now gives automated driving test tracks to applicants to bring down the discretionary powers of its officials. The website’s journey has been impressive. It gets 3,000-5,000 hits every day with 1.4 million hits so far. It has 20,000-plus bribe reports filed from 500 Indian cities. Next year it will boost its reach by focusing on the Hindi heartland. It is also launching a mobile application where people can use their phones to file their bribe reports. Corruption has strong cultural linkages. In India, relationship-based transactions are common. Political parties compete in doling out favours to certain castes and groups, thus encouraging corruption. They often use public office for private gain without any qualms. Access to all kinds of services, big or small, public or private — from hospitals to police stations, from schools to sporting events — is determined by personal relationships. “This is my friend and he has to be given special treatment is something Indians are used to,” says Ramanna. Initiatives like ipaidabribe.com are triggering a welcome shift. It shows how collective action can combat corruption at lower levels. Corporates too must work collectively to fight it. How we can prevent generation of black money?